In February, I was fortunate enough to spend some time with Future Islands in Berlin. They were just finishing one tour and had several more, along with the release of their album Singles, still ahead. The interview was possibly my favourite thing to work on this year... but, shortly afterwards, the band appeared on David Letterman and their year got a lot crazier. 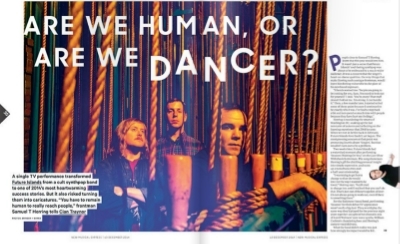 This was a follow-up piece for NME, reflecting on just how much had changed for them. You can read it here.